I know that you have noticed that I have been slacking with nail art designs lately. Well, I had some reviews that I wanted to post first and I recently went on a trip with some bloggers all over the Philippines that gave me a hangover because I had so much fun! More on that trip, soon! And finally, because my nail on my right pinky finger broke that I had to patiently wait for it to grow a little so I can file them into a decent shape. The design may look complicated at a glance, but it was quite easy to do actually. I would definitely recommend this for nail art beginners and to those who are struggling working with their non-dominant hand. I used China Glaze Man Hunt in 2 coatings for base color. Described as bold cobalt blue and it truly is. A gorgeous creme polish from the China Glaze Safari Collection that I got from Digital Traincase. Opaqued in 2 thin coats. Consistency is slightly thick but didn't cause any problem with application. I wore this as is for a day before deciding to spice it up with some nail art. I hand painted the design using acrylic paints and a detailing nail art brush. I thought of changing my polish when this abstract nail design came to mind. But I was not ready yet to let go of this lovely blue shade so I figured I'd work around it by creating an ombre look and honestly, I liked the results! The technique for the design is simple. Start with a dot to create a focal point. For a twist, place the dots at random places on every nail. Paint curve lines around the focal point to create a broken ripple effect. Make sure you paint the curves with enough space to reveal the background polish. I started with a pure white color as my focal point for the nail design and used 2 shades of blue to create the gradient effect. You can reverse the colors by starting with a darker shade of blue for the center and using the pure white as the last color. One good thing about this abstract nail design is that you really don't need to worry about creating perfect curve lines. This would make working with your weaker hand easier. And this is also the reason why I would recommend this for nail art beginners and to those that are trying to control their non-dominant hand during nail painting. 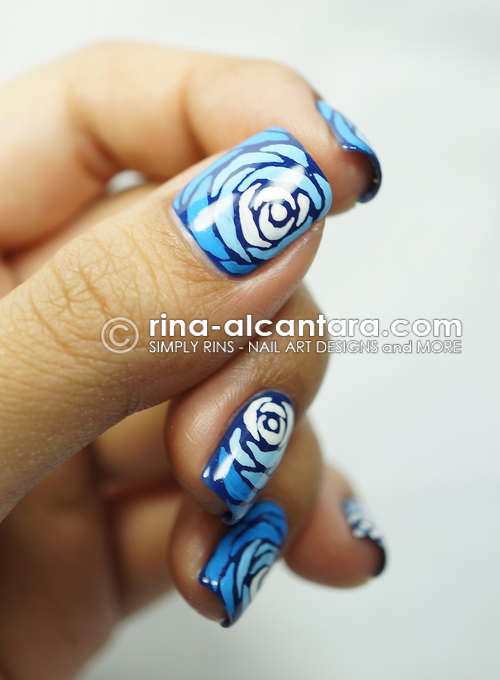 After I took some photos of this nail art, it dawned on me that it somewhat looked like a close-up of a rose since I paint my roses the same way I did the curves on this design. Can you see it? I always see abstract nail designs very flexible in terms of color combinations. A rainbow theme would probably look amazing with this design, but would also probably require more time to do because of the number of colors required to complete the nail art. Oh, and please excuse the unusual number of pictures on this nail art post. 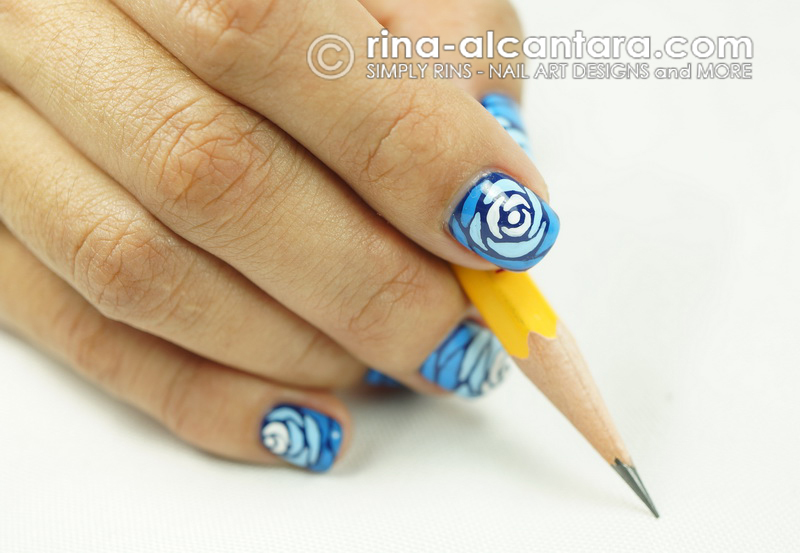 I enjoyed the photo shoot as much as I enjoyed creating this freehand nail design. I was also trying out new poses. Guilty! 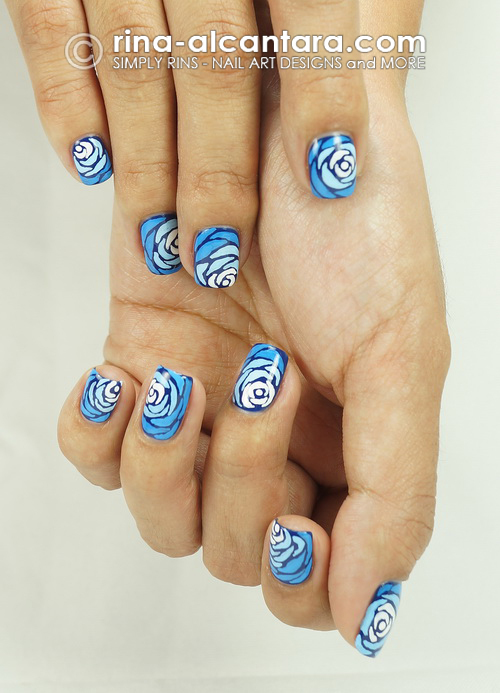 I hope you liked this blue ombre inspired nail design as much as I do and hopefully it would inspire you to try it. Perhaps it could also give you an idea for a nail design. Can you see yourself wearing this nail art? This looks amazing! I love it when something so difficult looking turns out to be pretty simple, because at first glance I thought "How did she do this?!" And yes it actually looks like Roses. Pretty colors as well! This is beautiful work. Lovely! This is lovely, I like the gradient effect! I totally thought rose when I first saw it too though, because this is one of the ways I draw roses - in fact it's how I first taught myself to draw them when I was a kid so I've been doing it a long time! Gorgeous, and clever! 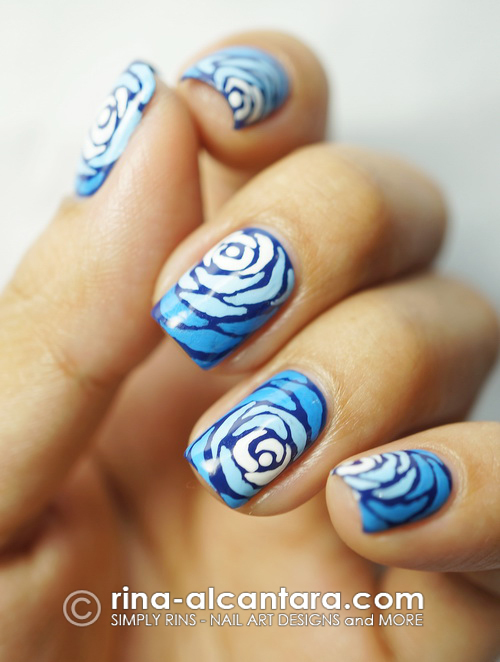 I thought they were roses to start with, and I still think they are roses :D I'm going to try this, absolutely. Thanks for the how-to-do, and the photos! I only see roses. I love them either way! Beautiful. :) It looked like closeups of roses to me at first glance. Roses it is! Isn't it wonderful how this nail art design can be viewed differently? Woot! *gasps* Pretty! I really love your designs and I'm in awe of your skills. woow..wonderful. I would love to make it. I just thought you should know I did a version of your design myself. Thank you so much for the inspiration. You are amazingly creative! I instantly saw the rose design with these- it's what originally drew me to this post. So gorgeous. I'm gonna try and make an attempt at these before the end of the week. I love your work! wow! when i first looked at the pic although it was superb i was about to take a pass since I would never dream (well may b after few more months of nail art practice and blogging, I may) of creating something so complex and wonderful. But the tutorial was such a pleasnt surprize.....I lllloooovvvvee it...I am sure going to this....thanks a lot for posting this..